Join us for the Bow Tie Classic in Memory of Bob Biggins! Since its 2001 inception, our lively and welcoming golf outing has raised more than $1 million to advance our mission to support funeral service in building meaningful relationships with the families and communities it serves. This year's Classic is dedicated in memory of Bob Biggins, who was a sitting Foundation trustee and NFDA past president. 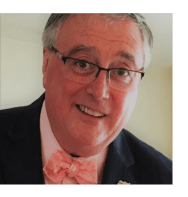 A consummate funeral director and Irishman known for his compassionate nature and signature bow tie, Bob was beloved by all, and had an undeniable passion for funeral service. Join our Bowtie Benefactors Dodge and CFS and gather a foursome of friends and clients in memory of Bob, whose mission and life's work was caring for families in their moment of greatest need. We'll be teeing off at Mountain Dell Golf Course. Just a short drive from Downtown Salt Lake City, Mountain Dell offers breathtaking views, rolling fairways and dramatic tee shots. No foursome? No problem! You’ll golf, network and “take shots” with a team of fellow funeral service professionals. New this year: We’re offering a limited number of complimentary single-player registrations to licensed funeral directors, subject to availability. Click here to learn more. Ken Cahall | Cahall Funeral Home, Inc.